Works great, may eventually need a battery. Look at the photos for the actual condition. Has been tested and works well. Has 2 new CR2025 batteries installed. This is a great little tool! Seiko SR-S9003 SII Japanese English Dictionary Translator Pocket Portable S9. Only used once. In good condition. The packing has a tear on the front which is shown in the picture. The device itself is in good. Induction. Translates over 200,000 words and phrases. Backlit display for easy viewing in dim lighting. New CR2023 batteries installed. Includes original instruction booklet. Spanish/English Translator. There is a slight bend overall but that doesn't seem to affect anything when testing the functionality. Will make a good back up for translating. 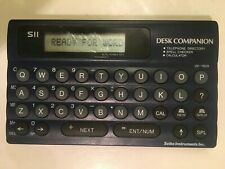 SII Seiko Instruments TR 2201 Berlitz Spanish English Translator. Condition is Used. Outside case has scratches. Still works. Any questions please ask. SII Seiko Instruments TR 2200 Spanish English Translator. Condition is Used. Shipped with USPS First Class Package. This item is in great condition. Batteries are not included. 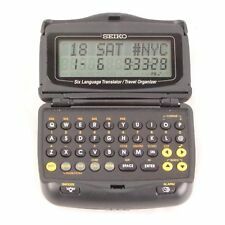 Seiko S II Instruments Electronic Translator TR-2200 Spanish English Pocket. Condition is Used. New battery. Works great. Shipped with USPS First Class Package. It's that simple. To all U.S. Zip codes. H Pocket Translator with Inflections TR-2020. SII Seiko Berlitz English-Spanis. Up for grab is a Japanese to English Dictionary from Seiko. very retro and cool item yet still useful if you want to study Japanese. This is a rare highend model with nice mono LCD display. tested, and in perfect working order. SII Seiko Instruments TR 2020 Berlitz Spanish English Translator . Condition is Used. Shipped with USPS First Class Package. Very minimal signs of use.